author Janes, K. A.; Heasley, J. N.
journal Astronomical Journal, vol. 101, June 1991, p. 2097-2101. Messier 9 (also known as M9 or NGC 6333) is a globular cluster in the constellation Ophiuchus. It was discovered by Charles Messier in 1764. M9 is one of the nearer globular clusters to the center of the Milky Way Galaxy with a distance of around 5,500 light-years. Its distance from Earth is 25,800 light-years. The total luminosity of this cluster is around 120,000 times that of the Sun, the absolute magnitude being -8.04. The brightest individual stars in M9 are of apparent magnitude 13.5, making them visible in moderately sized telescopes. There have been 13 variable stars found in M9. Nearby, at about 80' to the northeast of M9 is the dimmer globular cluster NGC 6356, while at about 80' to the southeast is the globular NGC 6342. Arellano Ferro, A. et al. 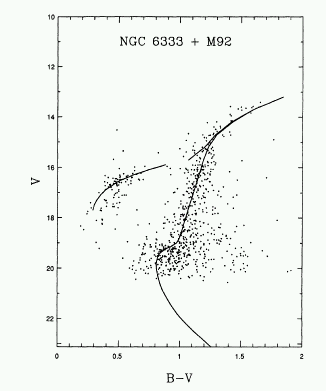 Janes, K. A.; Heasley, J. N.
1991, Astronomical Journal, vol. 101, June 1991, p. 2097-2101.